March 19, 6:45 p.m,. Society Hill Playhouse, Philadelphia. 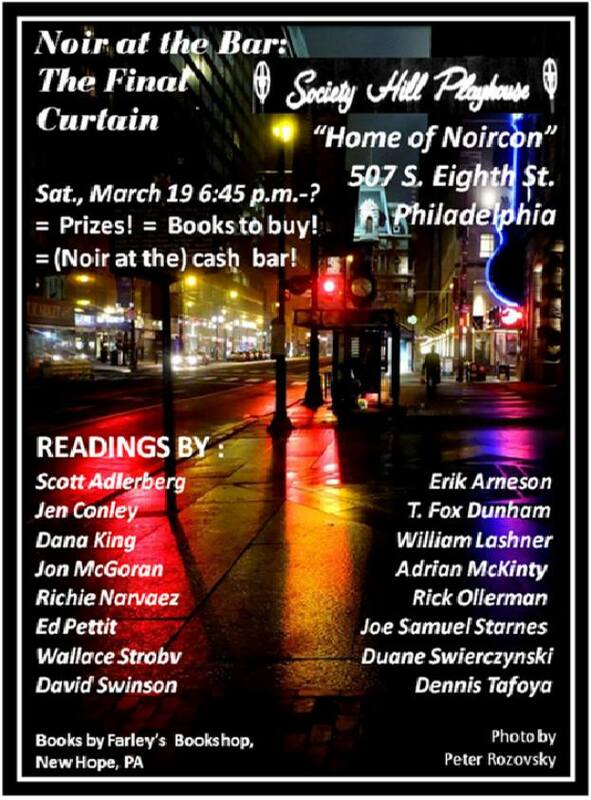 Be there for the biggest, best Noir at the Bar ever in the city where it all began. The Beloved Spouse and I will be there. She will lend class. I will provide my own brand of making everyone else look good by comparison. You're welcome. It's about time, Peter. Too bad I live on the other side of the country or I'd be at this exstravaganza for sure. Seana, you realize, of course, that Adrian is coming from Melbourne (albeit indirectly)? Geographic disability does not carry the weight it once did. Yeah--very indirectly. If I was on the northern East Coast, I'd come too. No one is flying in from California for this, but we do have people coming in from a number of other Noir at the Bar cities: Washington, Baltimore, New York, New Brunswick (N.J.). We even have someone coming from New Hampshire to read at this one. I think it's great, and expect a full report. At least one. I've been up little promo announcements for each writer at Facebook. I may group them into a series of blog posts. I'll be there. And I'll be sober. One of those 2 things is true. Just remember that we don't call it Noir at the Barred. But let me know via e-mail what time your transportation back to New York departs. That could affect the order of readers. I'll probably catch the 11pm or midnight train. Let you know closer to the time. I might want to eat somewhere first. Amtrak have surprisingly good food options. Last time I was on they even had Vietnamese food. Still better not to be hungry. No one wants to be on the midnight train to gorge phở. There are also plenty of places to eat close to the Playhouse. (If you want an even cheaper way to travel, both the Chinatown buses and Grehound will let you off a lot closer to the Playhouse. Their Philadelphia stops are right on the fringe of Chinatown, which means even more places to ear (Vietnamese among them). Lou Boxer and I talked about a post-boor at the Bar stroll over to the nearby Brauhaus Schmitz, which serves sausage, probably sauerkraut, and many, many kinds of beer. I guess my pun went over your head? If so, that only makes us even. Remember the time you posted some startling biographical information about Werner Heisenberg, and I asked if you were certain and--I cackle with glee at the recollection--you gave me a straight answer? And I quite enjoyed your pun. It was a pip. I remember it. I just dont where I was when you said that. I think the discussion involved Heisenberg and Nazi connections, but (and this is not a joke) I can't be sure. Odds are the discussion was at your place, mine, or Seana's. It was right here. Scroll down. I've actually been in touch with him about once a year or so. He had some life events, but mostly he got involved with helping some refugees from Africa and I think just found that enough to deal with without adding all the blog stuff. I still miss his contribution to the discussion, though. Give Seana the case. She can find anything! I miss Marco's contributions, too. He has a head on his shoulders and something in it. No, no special commands. I just used Google to search your name and Werner Heisenberg's and it came up pretty fast. Dana, don't be a -----. Just show up, read, and accept the resulting praise with good grace. Seana: Thanks. I wish I could remember that search command, though. This blog has been going on long enough that it would be nice to be able to search its comments again. Well, that's basically what I did, using Google. You just have to have the right key words. Maybe this webpage would give you some comment searching that you want. Maybe that was it. Thanks.